A few years ago I took my very first Cat Yoga class and it was one of the cutest things I’ve ever been blessed to participate in—until a recent trip to Mesa, Arizona, where I had the pleasure of attending a Goat Yoga class!! You read that right—Goat Yoga! Baby goats galore at Goat Yoga Arizona! 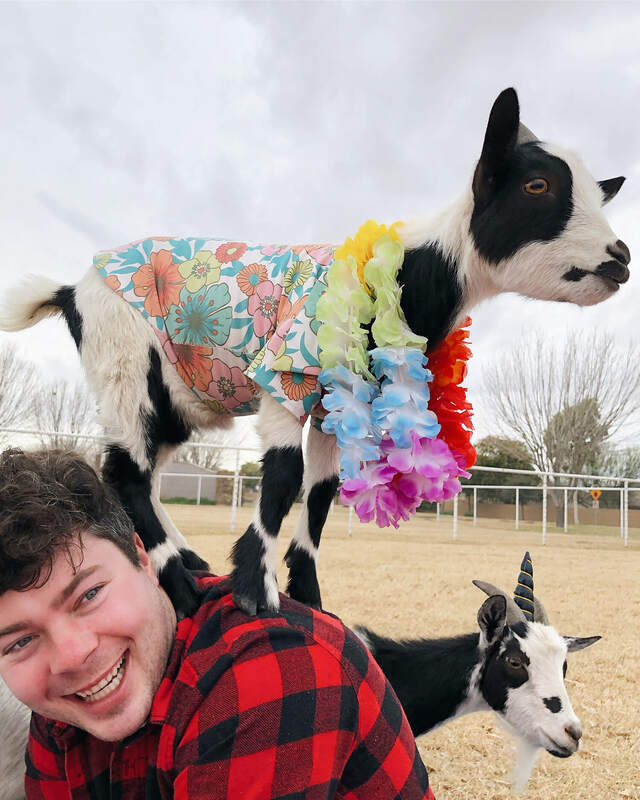 As part of a sponsored tourism weekend courtesy of Flair Airlines and Visit Mesa, Mike and I got to attend a goat yoga class by the original and leading goat yoga provider in Arizona—Goat Yoga Arizona. 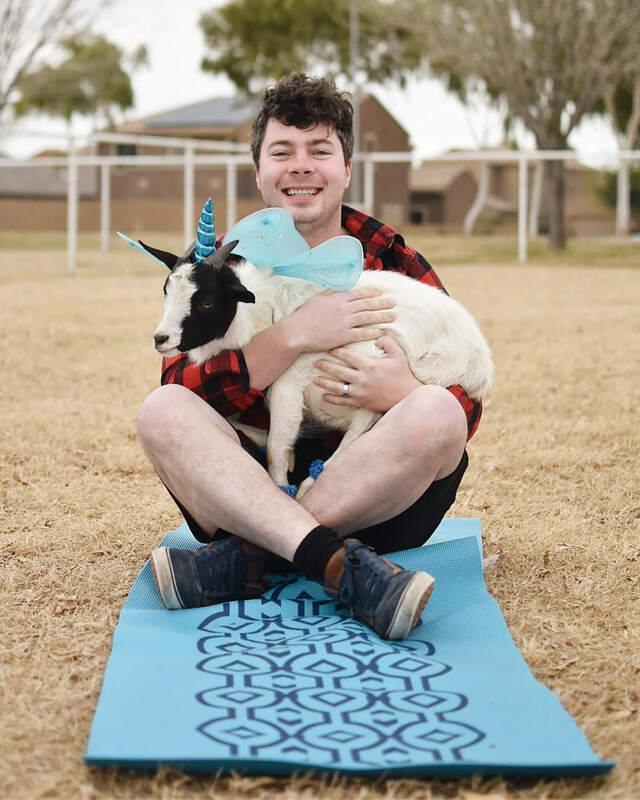 Goat Yoga Arizona began in February 2015 and is run by April Gould and Sarah Williams. April is a goat farmer and “Goat Whisperer.” Sarah has been a yoga instructor for over 20 years. April had goats. Sarah taught yoga. So they decided to combine the two and now offer the biggest and most popular Goat Yoga class in Arizona. 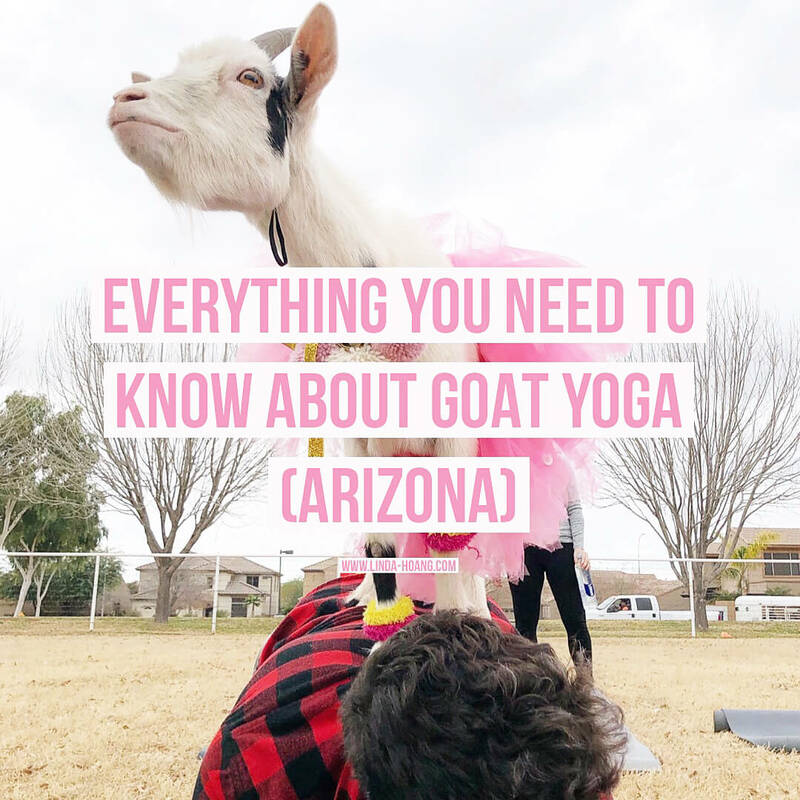 In this post, I recap our experience at Goat Yoga Arizona and share Everything You Need To Know About Goat Yoga! Pin + share my blog post: Everything You Need To Know About Goat Yoga (Arizona). When and where does goat yoga take place? 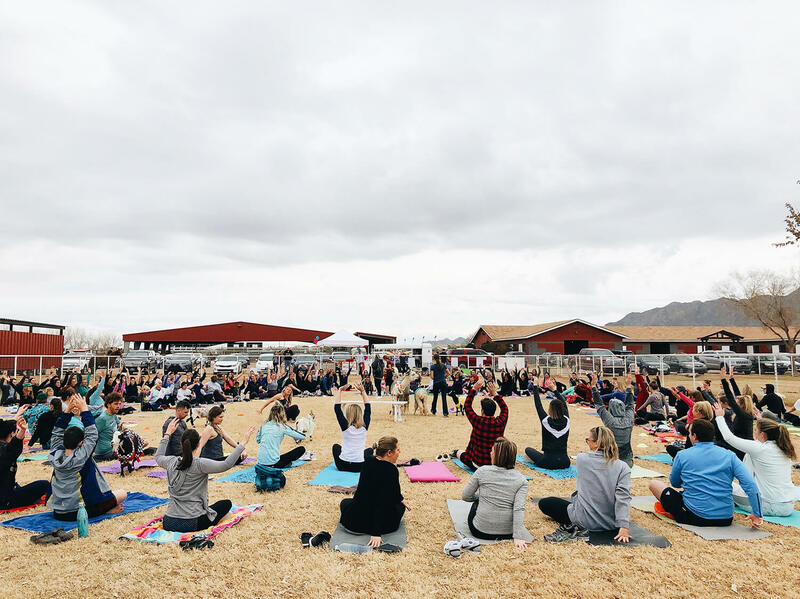 Goat Yoga takes place Saturdays at The John Volken Academy Ranch in Gilbert, Arizona (next to Mesa). 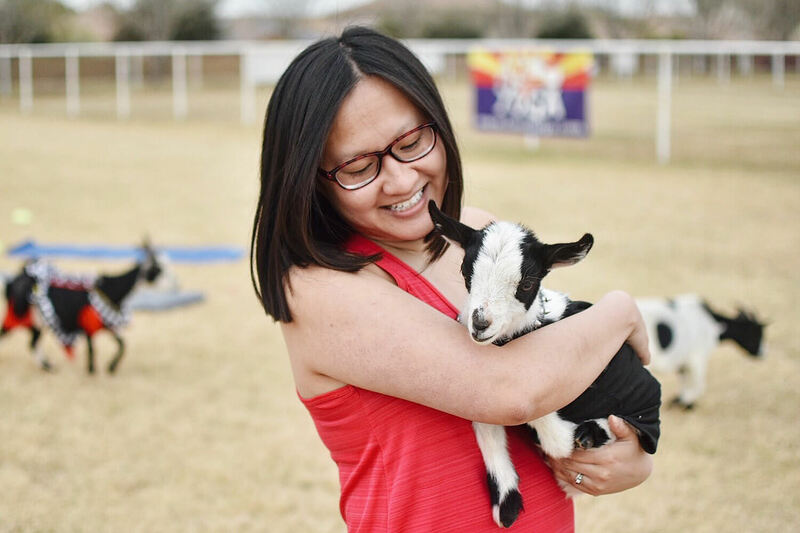 April and Sarah offer Goat Yoga most Saturdays at the The John Volken Academy Ranch in Gilbert, Arizona (26601 S Val Vista Dr., Gilbert, AZ). Classes typically begin at 10 a.m., however they are starting to offer sunset yoga classes as well, and some special classes on weekdays. 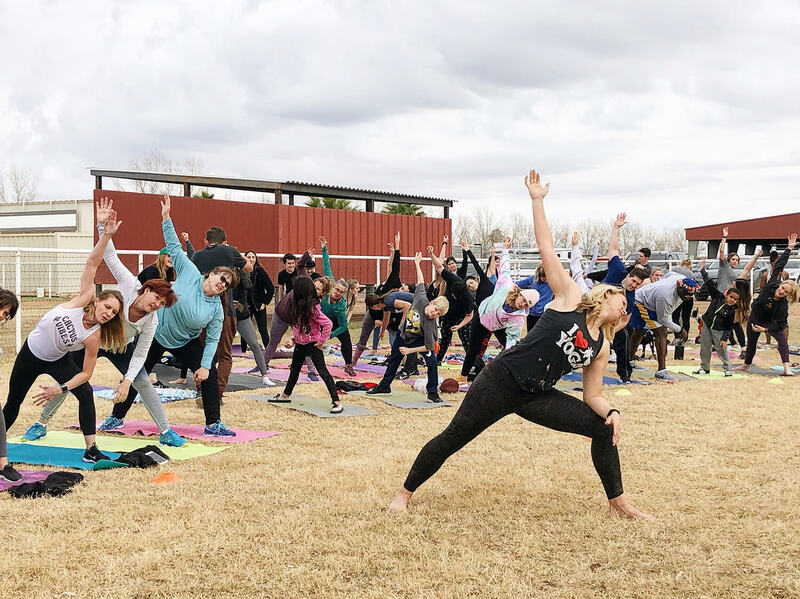 Goat yoga classes run year-round (because the weather is always nice in Arizona) and new class schedules are posted on the 15th of each month. A class is about an hour long, but that generally includes 15-20 minutes of dedicated photo-taking time with the goats. Goat Yoga Arizona also offer private goat yoga classes too! Goat Yoga is the best $15 you’ll spend. A Goat Yoga Arizona class will cost you about the same as a regular yoga class (possibly a few dollars cheaper!) Goat Yoga is just $15 if you book in advance. There are sometimes drop-in availability as well, but the drop-in rate increases to $20 (and sometimes you may be out of luck because these classes are so popular, with about 100 attendees in almost every class!) 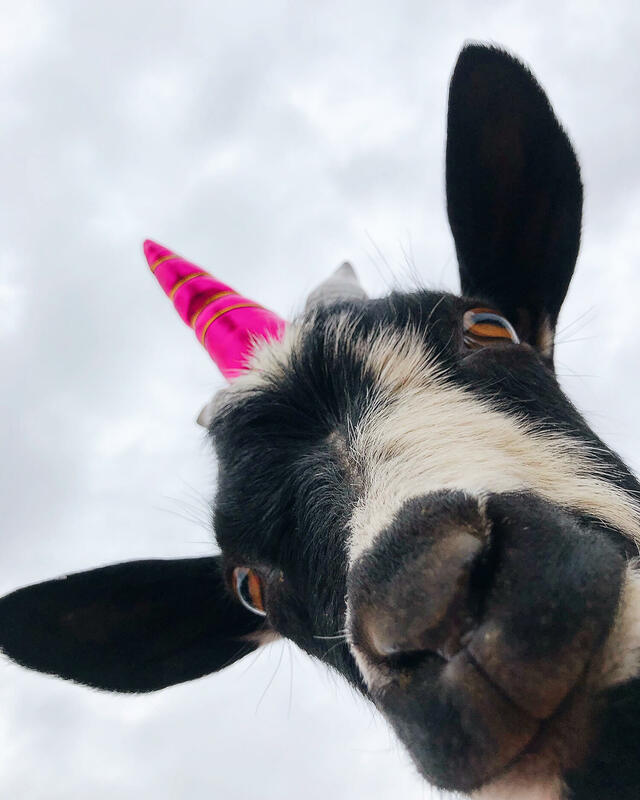 I think at $15, you’re getting such great value—not only are you getting a yoga class (albeit, a pretty casual yoga class), you’re also getting a ton of entertainment, photo ops, and goat memories to last a lifetime. What should you bring to goat yoga? This goat at Goat Yoga was a true queen. All you really need for goat yoga is a good attitude, friends, and a yoga mat! You probably don’t need a water bottle because the class is not overly intensive. Let’s be honest here, no one’s coming to goat yoga to improve their yoga practice. 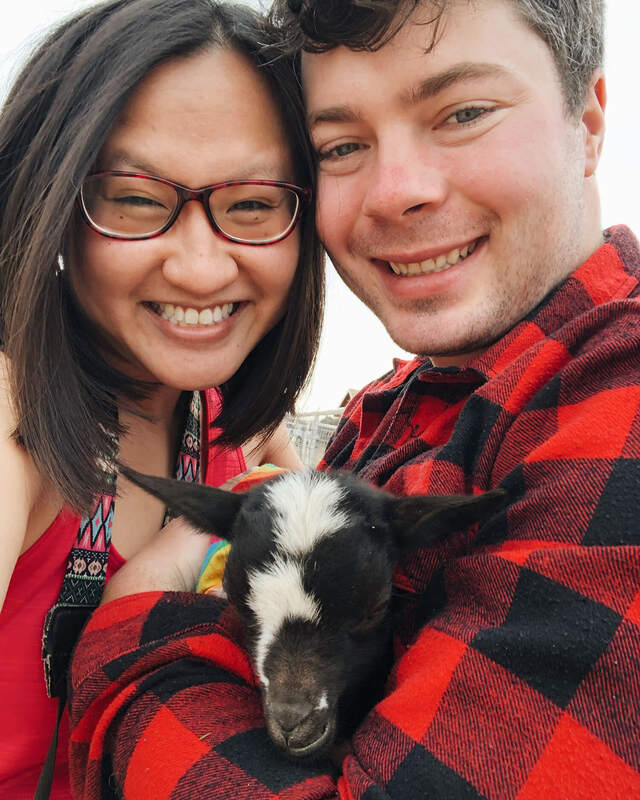 They’re going to goat yoga for the goats!!! And goats you shall get. It’s important to bring friends to goat yoga because you’ll want to take pictures of yourself with goats and you can’t really do that solo. They do have a photographer taking photos during each class (and they post photo albums up on their website! ), but no guarantees they’ll capture you. 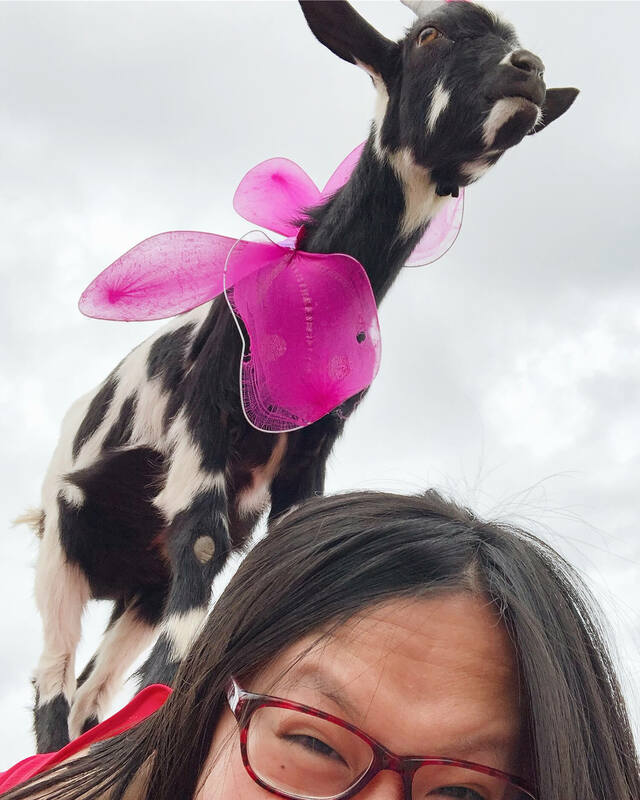 So if you want evidence that you did yoga with goats, it’s best to bring an entourage to capture photos of all the goats (and often, entourages do come—classes, sports teams, bridal or bachelorette parties, families are all typical groups that attend goat yoga)! What happens at goat yoga? You’ll be giggling all through Goat Yoga! As I’ve mentioned, not a lot of yoga happens at goat yoga. And that’s totally okay! Because people are here for the goats! There are a surprising amount of goats at Goat Yoga Arizona. I mentioned the cat yoga classes I’ve been to, there were maybe six cats in a class. A different class had a few kittens. But nothing like the number of goats we experienced at goat yoga. I would say, dozens of goats. Dozens plural. These include baby goats (OMG baby goats are so cute!) And they also have alpacas you can take pictures with too. At this goat yoga class you get into a circle formation (often a double circle formation because there are so many people who attend), and follow Sarah’s lead. This is a super casual class. She has you go through a few different yoga poses—particularly, yoga poses that most easily allow the goats to jump on your back (they jump from one back to another! They are trained to do this but also follow the lure of treats lol). A lot of people don’t even do all the yoga moves, they just watch / take photos of the goats on the yogis! After the more structured yoga is completed, Sarah and April demonstrate a few fun partner or group yoga poses you could try, and a goat yoga helper can come and place a goat on your back / in the pose for a photo! Your group is also welcome to go pick up a goat and place it on your backs / in the pose as well, you don’t necessarily need the helper to do it. That’s one of the things that surprised and delighted me about goat yoga—you can pick up the goats! In cat yoga, we were advised to leave the cats alone and if they come to you they come to you (often they don’t because you know how cats are lol). 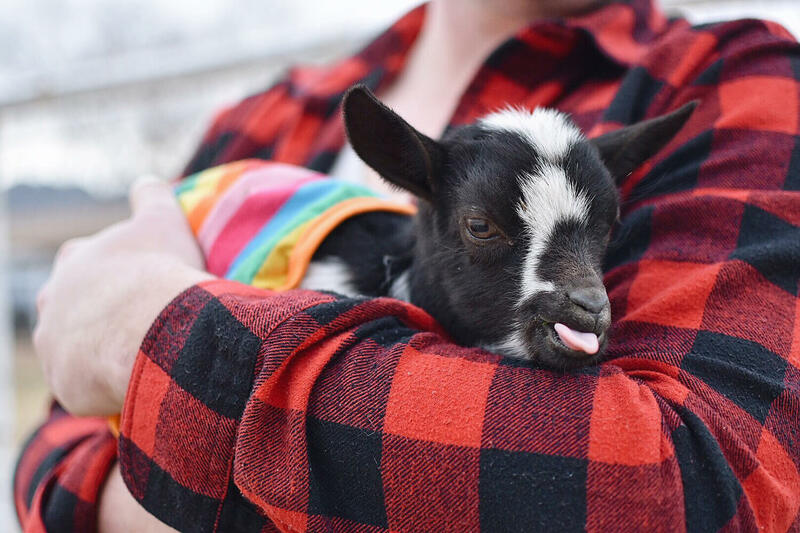 In goat yoga, you’re welcome to pick up and cuddle baby goats or the bigger adult goats, there are just particular ways you need to pick them up or hold them so that the goats feel and are safe. It’s amazing to see how comfortable these goats are with humans! Goat yoga is for all ages (kids welcome, but obviously with parental supervision, and they still need their own ticket). Some goats are heavy though (around 35 pounds) so if you don’t think your kid can handle a 35 pound goat on their back, or be able to sit through an hour yoga class, maybe don’t bring them. Oh, and I forgot to mention but as you can see in the photos: the goats are dressed up! 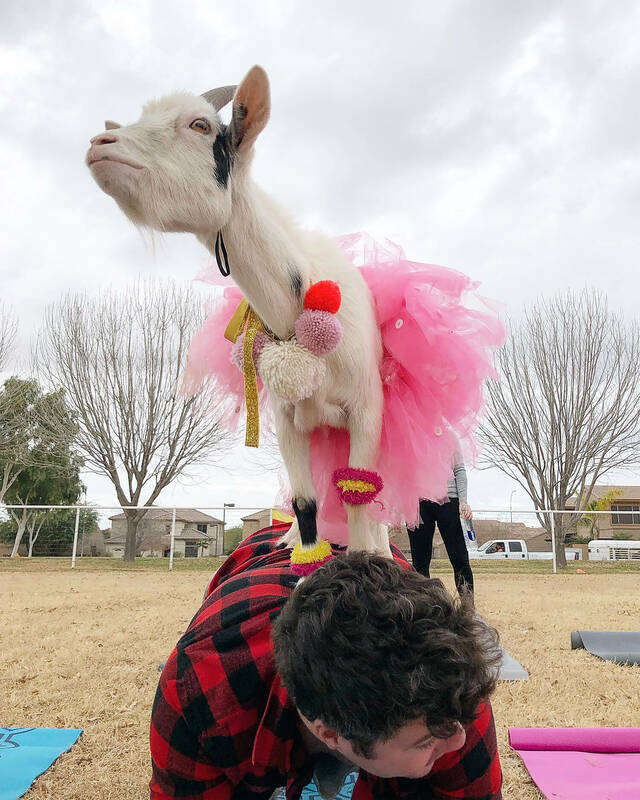 Seriously, as if goats alone wasn’t cute enough, at Goat Yoga Arizona, the goats get dressed up with little unicorn horns, tutus, and other adorable outfits. I can’t even. So to summarize what happens at goat yoga—you do some yoga moves and you take a lot of photos of the cutest goats ever, and you leave feeling SO happy. Why should you goat yoga? Making the very best goat memories at Goat Yoga Arizona. Our Ultimate Goat Yoga Stance. People thought this photo was Photoshopped but it wasn’t! 2. Don’t be alarmed about the goat poop. Yeah… the goats will poop! An hour is a long time to go without a goat poop, don’t you think? lol. Sometimes they will poop while they are on your back. Sometimes they’ll poop on your mat. The poops are like little pellets and are easy to roll off your mat (that’s another reason why it’s important to bring a mat so you’re not just doing yoga in poopy grass lol). Apparently the goats can sometimes pee on you too but that is far more rare and shouldn’t likely happen to you. It’s all natural~ don’t be alarmed about the goat poop! 3. Bring a change of clothes. Due to the aforementioned poop, but also just because the goats will be jumping and standing on your back after having run around in grass and potentially stepping on their own poop, it would be a good idea to bring a change of clothes for whatever activities you plan on doing after the yoga class has wrapped up. There are bathrooms on site at the ranch you could use (and a porta potty) though they encourage you to use a bathroom before you come to the class (offsite). 5. Consider pulling your mat over to a corner after the formal class has ended, for a cleaner goat yoga photo. That’s what Mike and I did! We didn’t want other people’s mats and body parts in (all) of our photos so at the end of class we pulled our mats to a corner farther away from the main group and grabbed a goat to work with for a few after-class shots. Have your phone/camera on hand for Goat Yoga, there will be so many moments you’ll want to capture! 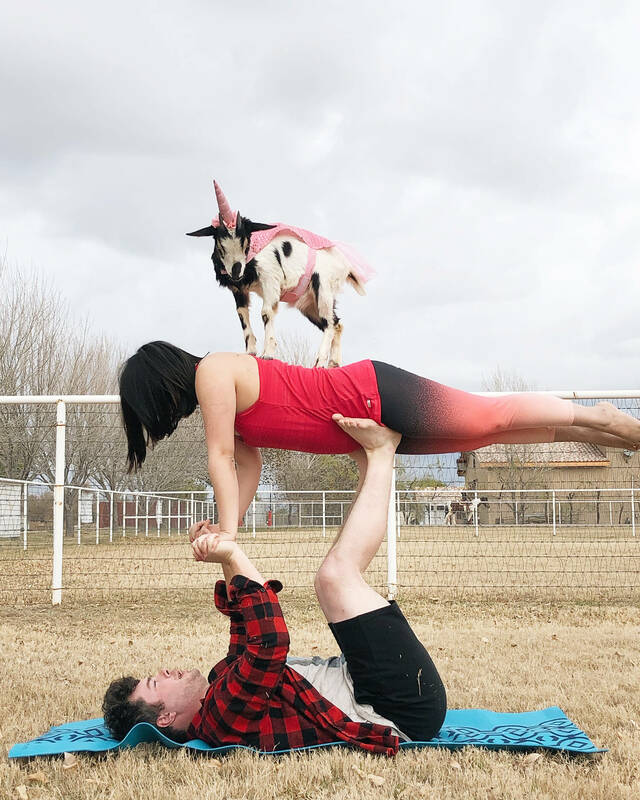 So that’s really everything you need to know about Goat Yoga in Arizona. Attending this class is a phenomenal and fun experience. There are so many giggles. People are having such a good time. The goats are having such a good time. And you’ll have just the best stories to tell and photos to share coming out of the class. Sarah has a wonderful energy and is a really funny instructor. And it’s been really fun learning more about Goat Yoga in general! Fell in love with the goats at Goat Yoga. 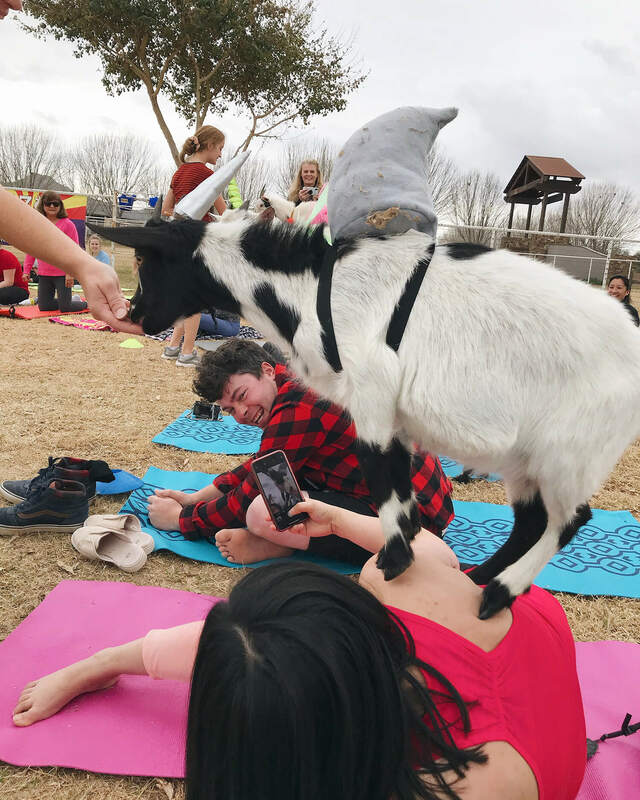 It’s not totally clear whether Goat Yoga originated in Arizona (but it seems likely as Sarah and April’s originated in 2015 and the earliest other mention I could find of goat yoga online was in 2016), but one thing is for sure—while it’s still a novelty yoga class, it is being offered increasingly around the world. There is Goat Yoga in Oregon, Washington, Manitoba (Canada), and across the pond in the UK. 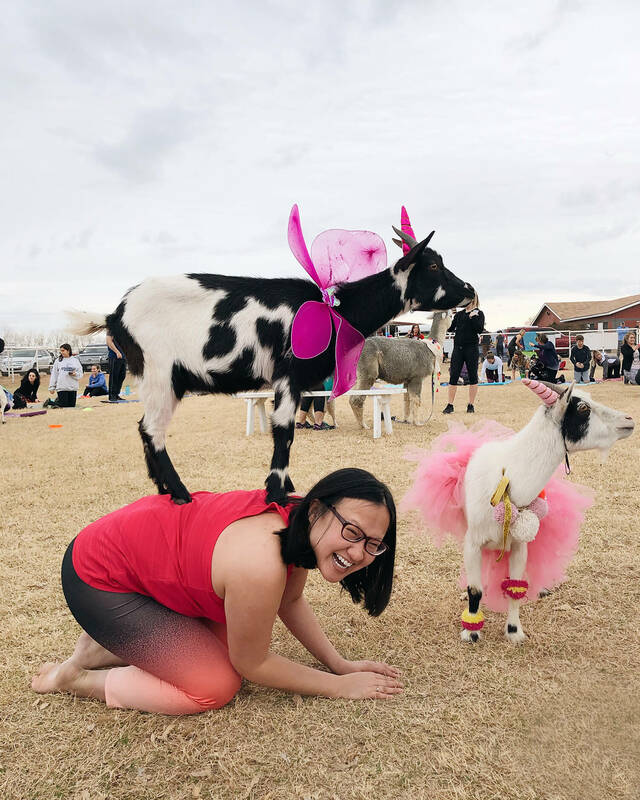 On February 23, 2019, Sarah and April will be putting on the “Largest Goat Yoga Class,” setting the Guinness book of World Records with 350 yogis and over 70 goats! This class is a bit more serious (pay attention—do the yoga moves!) so that it actually counts as a legitimate yoga class. 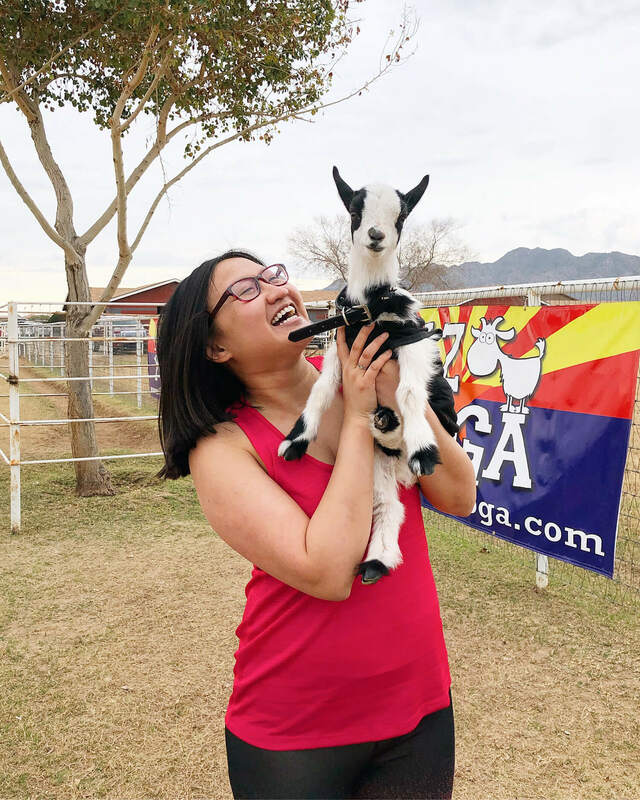 Goat Yoga is one of the top things to do in Arizona! And here are a few more photos from Goat Yoga!! Taking a selfie with a goat is harder than it looks, lol. 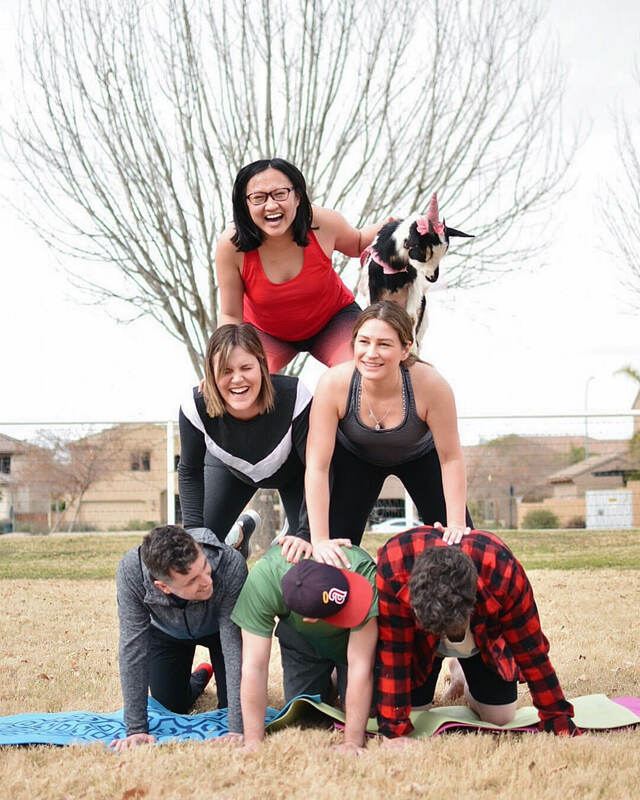 We attempted a Goat + Human Pyramid at Goat Yoga! Mike and I had such an amazing time at Goat Yoga Arizona! Thank you Visit Mesa & Flair Airlines for arranging the experience! Thanks again to Flair Airlines & Visit Mesa for hosting Mike and I in Mesa, Arizona! Disclaimer: I traveled to Mesa, Arizona on a sponsored tourism trip courtesy of Flair Airlines and Visit Mesa. This does not impact the opinions stated in this post. 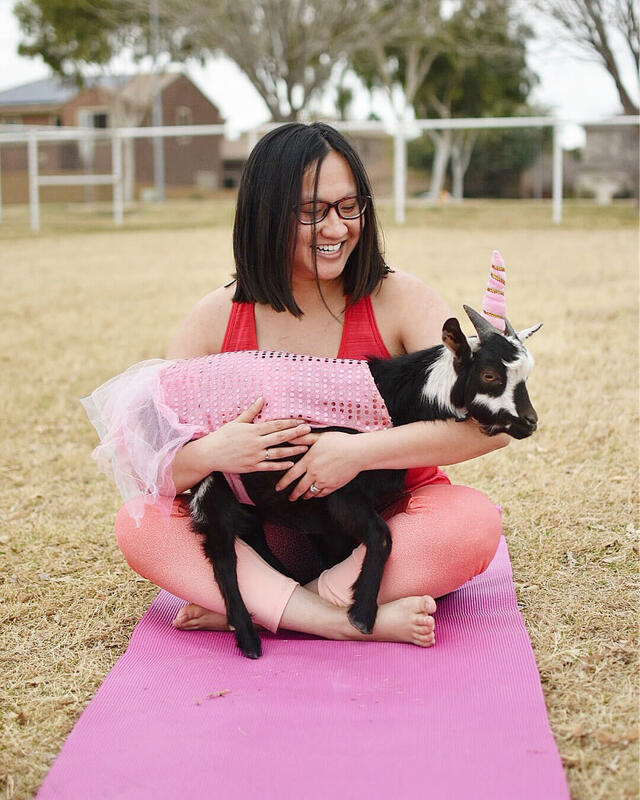 I actually practice (casual) yoga myself, have partaken in novelty cat yoga, and I am a huge lover of animals so add goats to my yoga and I am one happy … goat. lol.